Pune Based Mobikon, a niche mobile marketing company specially targeted towards hospitality Industry, has raised USD 1.7 million Series A funding led by Singapore-based Jungle Ventures and supported by other angel investors including Ravi Mantha, Member of the Board of Trustees at The Indus Entrepreneurs (TiE). The 2 other investors are US based and are Ex-Facebook and Google guys. Founded by Sameer Khadepaun and Salil Khamkar in 2009, Mobikon started off as Mobile SMS based marketing and customer engagement platform for Hospitality Industry. Over last couple of years their flagship product KONEKT has grown into an integrated suite of digital marketing, analytics and customer engagement applications. Mobikon currently claims to have over 100 customers in hospitality and retail sectors in India and other regions in South East Asia. Mobikon’s KONEKT platform allows Hotels, Spa’s, Restaurants etc. to seamlessly create mobile websites and apps which are tightly integrated with various social platforms. 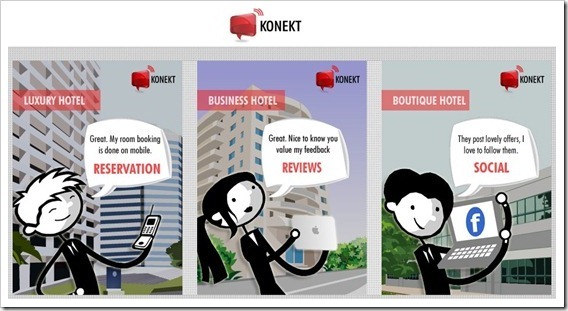 KONECT also helps in collating and analyzing feedback from their customers. Mobikon, which was earlier an India incorporated company have recently shifted their base to Singapore as the new company is now called Mobikon Asia Pte Ltd and is based out of Singapore. We spoke to Sameer in regards to funding and he mentioned that funds will be primarily used for aggressive growth Mobikon is expected to have in coming months. In last couple of months Mobikon has grown from 14 to 30 member team and are expected to reach 50 shortly. One of the founders, Salil Khamkar has now moved into an advisory role and will not be part of day to day operations. Mobikon currently has office in Pune, Singapore and Bangalore and they will shortly be opening their offices in Mumbai, Delhi and Surat. They also plan to set up offices internationally in Thailand, Indonesia and Australia. is there anyway to contact mobikon team…… their website is completely down and out for now. Hi Sidharth, you can connect with Mobikon team here at [email protected] or you can call us at 09764449448. We are sorry for Inconvenience! I know its too late to reply, but it never late as we are into customer satisfaction industry.